China is not known for its commitment to sustainability. The Council for Foreign Relations reports that the country’s environmental crisis remains one of the largest in the world. Air pollution north of the Huai River has caused the life expectancy of people in that area to be five years shorter than the southern region. “Its economic rise, in which GDP grew on average 10 percent each year for more than a decade, has come at the expense of its environment and public health. China is the world’s largest source of carbon emissions, and the air quality of many of its major cities fails to meet international health standards. Life expectancy north of the Huai River is 5.5 years lower than in the south due to air pollution (life expectancy in China is 75.3 years, according to 2013 UN figures). Severe water contamination and scarcity have compounded land deterioration. Environmental degradation threatens to undermine the country’s growth and exhausts public patience with the pace of reform,” the report warns. A lot of factors need to be assessed while analyzing the state of the environment. One is the role of the new CNC machining revolution that has gripped the country. Are CNC Machines Threatening China’s Environment? Many products on the market have been made by CNC machines in China. How are they affecting the environment? This is something many people don’t think about, even if they are committed to green living. One of the biggest reasons so many overseas customers have CNC machining and milling projects carried out in China is due to the price. They rarely think of the environmental impact. CNC mill projects are comparatively cheaper in China compared to other service providers across the globe. However, part of the reason that they are cheaper is that the country doesn’t hold manufacturers to the same environmental standards. This could have a serious impact on the rest of the country’s environment. Can China Produce Cheaper CNC Machines without Threatening the Environment? Low costs from Chinese manufacturers do not yield low quality products. Many people wonder how the machining projects in China are higher quality and cheaper as compared to other countries. The team at Wayken has an experienced CNC machining, CNC milling aluminum and other rapid manufacturing service providers. They are also more committed to environmentalism than most other countries too. There are a number of reasons that CNC machines are cheaper. A recent study by Elesevier addresses some of them. It mentioned that costs could be reduced, while also improving the environment by taking certain measures, such as replacing cast iron CNC machines with lighter variations. The Chinese government understands the global demand for raw materials such as aluminum, steel, plastics quite well. Therefore, it has partnered with several countries such as Sri Lanka and Pakistan to get various infrastructure projects for required natural resources. This makes sure that the Chinese industry have a surplus of cheap raw material supply throughout the year. Although labor cost in some other countries such as Bangladesh and Thailand is lower than China, the skill and experience in these countries for manufacturing and production is much lower, especially when it comes to CNC milling projects. Chinese factories such as Wayken have much higher and flexible machining productivity because of the larger workforce and end-to-end supply chain network. No matter what type of industry you belong to, you will find the supply chain greatly improves your production efficiency along with a huge reduction in the manufacturing cost. For the CNC manufacturing industry in China as well, there are lots of factories and small companies in the CNC supply chain that provide raw materials and support to different CNC machining shops. All these at one location results in lower production cost. China is a rapidly growing country with a population of more than 1.39 billion people as of 2017. The huge human resources available allows for low labor costs. The workers in this field are also adequately trained in CNC operations therefore, they can perform better and in a much more professional way. On top of the costs for manufacturing and consultancy, Wayken operates on a thin profit margin. They strongly believe in operating on high economies of scale. We tend to keep our profit margins low and cover the gap via subsequent boost in sales. This way we can provide better rates to our clients as compared to other CNC manufacturers in the country and overseas. Most of the readers on this site have heard about Computer Numerical Control (CNC) technology, but anyone who has not heard of it before will know about it soon, due to widespread acceptance of CNC by many manufacturers. Though 3D printing is in its infancy stages, it offers huge potential. Many modern prototype manufacturers and consumer markets are turning to 3D printing as it is one of the most efficient ways of rapid prototyping. 3D printing has almost zero waste material and allows product manufacturing in a much more efficient way. It is anticipated that one day, 3D printing will be able to replace all other rapid prototyping techniques and will be the gold standard for prototyping. CNC will allow the manufacturing of existing products to be manufactured in a much more refined and efficient way. The processes that were once done by hand will now be fully automated. CNC paint sprayers or etching devices that were once moved by hand can now be done with much more precision and accuracy with automated machines. There still exists some complex geometries that require multiple tooling and machining in order for them to take their shape in real life. With rapid advancements in CNC milling machine projects, it is expected that only one machine can fully automate and make complex geometries in the near future. Just like the internet, the CNC machining projects will continue to evolve to the point of full mobility. 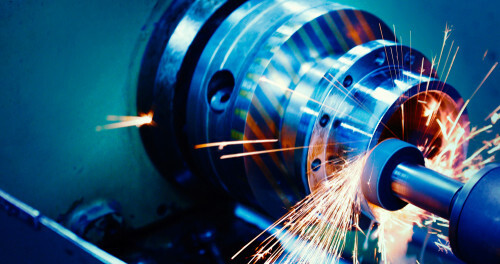 Machining projects of today require heavy machinery operated by experienced operators. With time and advancements, it is possible that machining projects for beginners are a reality and can be done over at home or SMEs. Fully mobile CNC milling machines can also mean that small scale easy machining projects can be done at home by the users and do not have to rely on third-party CNC manufacturers. Such machines also mean that the prototypes can be made anywhere and anytime regardless of a need of dedicated place for manufacturing. Milling projects or CNC mill projects are done via applying a machined surface finish on metal or plastic in order to create complex 3D shapes. Milling machine looks somewhat like a drill press, and uses a sharp cutting tool that can move in all directions and axes, removing the excess material to achieve the desired part shape. CNC milling machine projects are carried via a block of material is placed on a moving table below the cutter. As the cutting tool turns, a dedicated computer controls the horizontal and vertical motion of the block of material. At Wayken, let it be easy machining projects or hard, we cater to all types of machining projects for our clients. We can handle large volume runs without compromising quality and speed. We invite you to come over to us and see your ideas turn into prototypes and soon a profitable product. There are a number of great benefits of CNC machines in China. However, some don’t have the best environmental track records. The good news is that a number of new changes can be implemented to make them more environmentally friendly.